Here we are at the end of the season again. It’s been a weird, kind of aimless season but I’ve liked it. Also in case anyone missed it, the shows been renewed for what I presume is going to be the final season. I say because even though they’ve diverged from the books a bit they’re still following the basic arc of the books fairly well and I don’t know what they’d do if they tried to go beyond that. 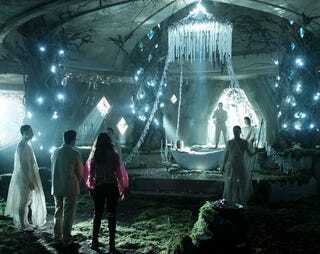 Anyway, Welcome to The Magicians season 2 episode thirteen “We Have Brought You Little Cakes” spoilerific reaction thread where you can share your thoughts on the show as it plays out or after it’s done. If you have any personal reviews/recaps of this show that you want to share with everyone one else throw a link down in the comments and I’ll throw it up here. Beware the Magicians below they’re very spoilery! !